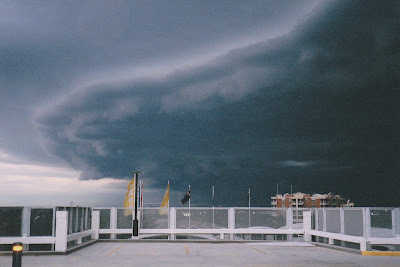 This photo was taken in 2005 sometime, from the roof of Rhodes Shopping Centre, near Concord, NSW. I was leaving work for the day, staff had to park on the roof, and when I got up there I couldn't believe my eyes, it was like something out of this world rolling across the sky. Soooo glad I had my film Point & Shoot in the car. This is the kind of picture that reminds me to keep my camera on me at all times. this pic is really beautiful in a haunting way! !one of the rarest of pics i have seen and and one of the rarest of moments that one can come across! !nice job of keeping a camera with you! !really well taken pic!! We had a supertyphoon come over my village when I lived in China. I got some great pictures of it, especially when the eye of the typhoon was directly overhead. Nature knows how to make great pictures. Stopping by from Blogged to say hi! wow that is one scary sky.